Months after Brad Livingston was let go, the Central York school board appears ready to approve a new football coach. 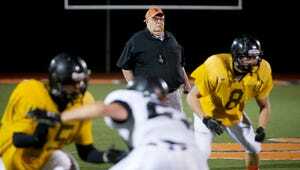 Months after longtime coach Brad Livingston was let go from the football program, the Central York school board appears ready to approve a new head coach. Joshua A. Oswalt is listed on the agenda for Monday's meeting for appointment as head football coach. Oswalt was previously the head coach at Carlisle High School and played college football at Shippensburg University. Calls to Oswalt and athletic director Marty Trimmer were not immediately returned.